Photo above: Saharawis demonstrate against EU plans to fish in Western Sahara, 7 Dec 2013. More than 20 injured. "Today's decision by the European Parliament flies in the face of the people of Western Sahara. The Saharawi have under international law the right to be heard on economic activities taking place in their land under occupation. The EU has today neglected those rights. All EU's rethorics of Human Rights Day today proves to be shallow", states Erik Hagen, chair of Western Sahara Resource Watch (WSRW). 204 parliamentarians voted against the agreement, while 310 voted for. 49 abstained. The owners of the stocks are either living under brutal Morocan occupation, or in refugee camps in Algeria. More than 100 UN resolutions call for their right to self-determination. 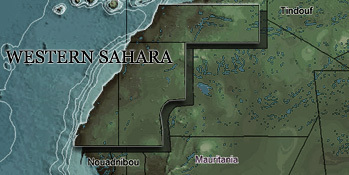 No state recognise Morocco's claims to Western Sahara. Last weekend, a Saharawi demonstration in the capital of Western Sahara, protesting the EU’s plans to fish in occupied waters, was violently dispersed by the Moroccan police. More than 20 were injured. The situation is growing ever more tense, as more and more Saharawis are increasingly frustrated with the EU’s consistency in choosing Morocco as a partner for business in their land, while turning a blind eye on the gross and systematic human rights violations that Morocco perpetrates in the territory. Instead Morocco will be paid for 40 million € per year in exchange for access to non-Moroccan waters. Apart from violating international law and disrespecting a people’s fundamental right to self-determiantion, the protocol is also bad business for the fish stocks in the area. A Greenpeace report, urged the EU not to approve, of environmental concerns.